I’ve been remiss. Crazy Cake Season is two-thirds over and I haven’t posted a single cake blog! I admit, it’s because I felt this year’s cakes weren’t as good as previous years. 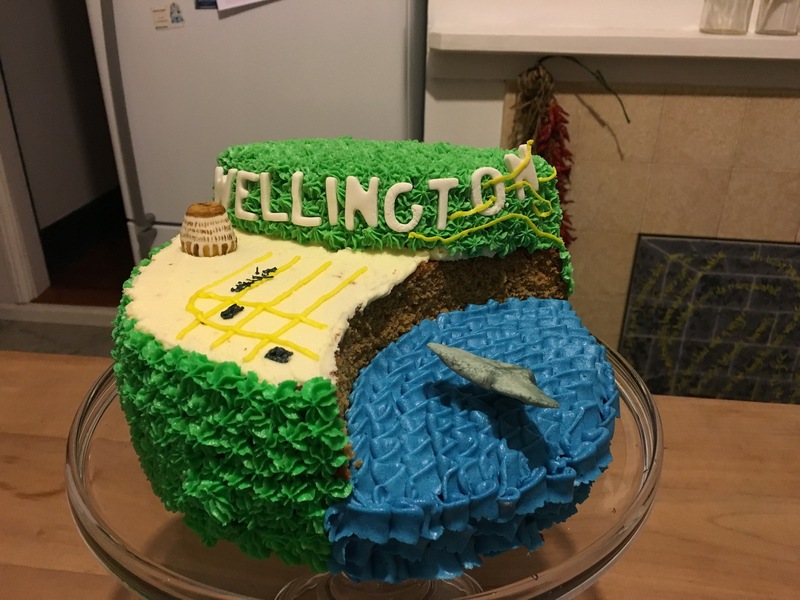 In part, the kids asked for challenging subjects for their cakes: slime moulds (daughter) and a 3-D map of Wellington with all the buildings (son). 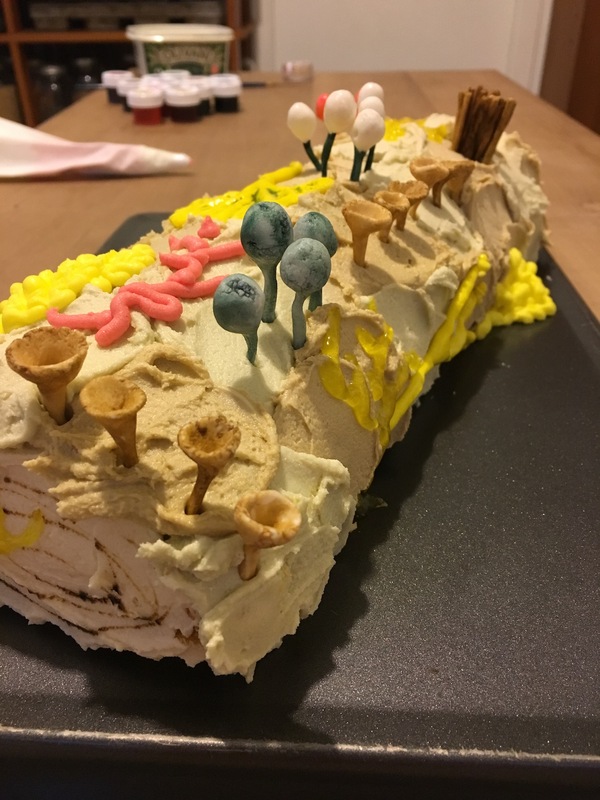 I resisted the urge to create a big pile of dog vomit slime mould for my daughter’s cake, and instead created a log covered in slime moulds of various species. Mexican paste worked well for the stalked fruiting bodies, and a little gum arabic glaze made them glisten like the real thing. All in all, it was a successful cake (she was able to identify most of the species, so I got points for biological accuracy, at least), but it wasn’t a cake with a lot of visual appeal for most people. The Wellington cake was trickier. A map of Wellington? In cake?! I opted for a Wellington-themed cake, instead. Mexican-paste letters created a passable replica of the iconic Hollywood-style Wellington sign. A Mexican paste whale tail rises over the choppy waters of the harbour, and a replica of the Beehive proves you can actually make that building uglier than the original. The map? Well, I did try to create a map of the neighbourhood where my son will soon be living, but my icing wasn’t behaving well (it was a very dry 30 degrees C in the kitchen, and it was variously melting and crusting over), and that bit was quite a disaster. The end result wasn’t something to feast the eyes on. But in the interests of full disclosure, here they are: this year’s lacklustre cakes. The good news is that they tasted great! The slime mould log was a lemon curd jelly roll that was one of the most flavourful cakes I’ve ever made, and perfect for summer. And the Wellington cake was a reliably delicious spice cake recipe with a beautifully soft texture. So, regardless of their look, they were enjoyed by everyone. One more cake to go in Crazy Cake Season!